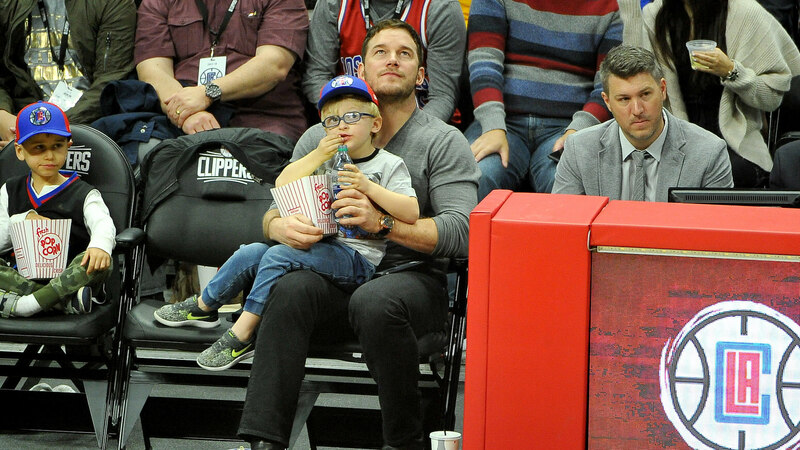 Before what is sure to be a whirlwind of promotional events for the upcoming Jurassic Park sequel, Jurassic World: Fallen Kingdom, actor Chris Pratt took some time to take in a basketball game with his 5-year-old son, Jack. Us Weekly reports that the two had courtside seats at the Staples Center, putting them right in the middle of the action as the LA Clippers faced off against the Minnesota Timberwolves. Jack showed off his Clippers loyalty by sporting a baseball cap with the team’s logo, though alas, the star power coming from the dad and son duo wasn’t enough to push the team to victory. The home team lost, but Jack and Pratt seemed to enjoy the game nonetheless. Both were all smiles as Jack sat on his dad’s lap and chowed down on popcorn. Us adds that the two stepped out together just five days after Pratt and his ex, actor and mom of Jack Anna Faris, officially filed for divorce. After eight years of marriage, the two cite irreconcilable differences as the reason for the separation — and requested joint custody of Jack. Here’s hoping these two get to spend plenty of time together before Pratt’s schedule gets too full. In addition to promoting his latest dinosaur-filled film, Pratt recently hosted an episode of Jimmy Kimmel Live and is set to promote back-to-back blockbusters with Avengers: Infinity War on the docket as well as The Kid, costarring fellow Marvel vet Vincent D’Onofrio.